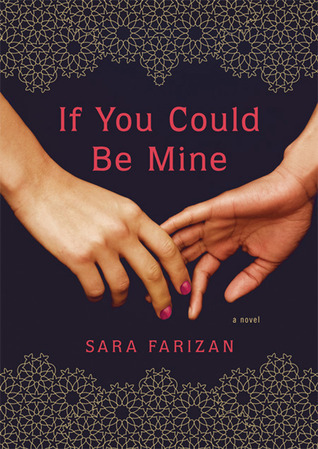 Book Review: If You Could Be Mine by Sara Farizan - Book.Blog.Bake. A book like If You Could Be Mine is hard to review because as a fictional exploration of a very real, very pressing social issue, I think it does it’s job. While reading, I felt I got quite a bit of insight into the Iranian culture and really came to understand where Sahar is coming from. As a book, it didn’t quite do it for me, and while there are multiple reasons for that, there’s one in particular that stands out: I didn’t want Sahar to succeed in being with Nasrin because Nasrin, while a product of her environment, is quite simply a jerk. Since the whole book centers around Sahar trying to find a way to be with Nasrin–even going as far as to consider sexual reassignment surgery– this was a major point where the book went downhill for me. No matter what Sahar did, I was hoping she would fail, which is not something I want to be thinking about a main character. Sahar herself was a sympathetic character, but Nasrin seemed to regard Sahar as merely a passing moment, while for Sahar, Nasrin was her life. In this mindset, it was hard to root for the main characters. Here’s the thing: I didn’t want Sahar to succeed because I found Nasrin to be utterly unsympathetic. At no point did I ever BEGIN to even entertain the idea that Nasrin really loved Sahar. At all. And so of course I was rooting for Sahar to fail in her mission because even though she wasn’t the best character either, she deserved better. None of the characters felt like real people–they all seemed to exist for the sake of the story, instead of the story coming naturally from the characters and their development. The writing also felt a bit sloppy and rushed. After talking about it with other readers on Twitter, I’ve seen multiple people say, and I agree, that this felt like a first draft. If it had gone back and forth between the editor and author a few more times, if it had been polished a bit more and some of the pacing tightened up, I think I could have enjoyed it. Ultimately, though, it just wasn’t an enjoyable or that enlightening of a reading experience. As I stated in the first paragraph, the book’s exploration of the Iranian culture and attitude did a good job of educating me, and it was these parts of the book I enjoyed the most. I also enjoyed the exploration of Sahar’s relationship with her father, which was tense due to her mother’s death which happens before the book begins. Moments like this– where Sahar and her father finally talk a little about their grief– are the brief shining moments of this book, which is unfortunate, since it’s not the focus. Ultimately, there’s not a whole left to say about the book. It left me with a “meh” feeling, though the ending did perk up my opinion slightly, though it felt a bit rushed. I really enjoyed the character of Sahar, but I couldn’t root for her when her purpose was to be with Nasrin, since Nasrin never treated her right. The bit of positivity I have about this book comes more for what this book could mean for future works in the YA category that explore issues of sexuality, gender, and culture, rather than the actual work itself. Final Impression: If You Could Be Mine does a good job of introducing readers to the culture and attitudes in Iran, but unfortunately focuses two girls who I couldn’t root for as a reader because their relationship seemed so uneven and I found Nasrinto be quite a jerk to Sahar. It made it impossible for me to really root for Sahar, so while I was sympathetic towards her, I was rather “meh” towards the rest of the book. Some good aspects, but overall was lackluster for me. That being said, I do think this book is important as a conversation starter and shows a great need for books like this in literature. 2/5 cupcakes. I still haven’t read this one, though the idea of it being set in Iran made me quite happy… but anyway, I haven’t read it because most of the reviews agree: either the main characters aren’t quite sympathetic, or the setting isn’t described as well, or the writing isn’t as good as could be – all around, I have yet to read a single review RAVING about this book. It seems like it’d fall in the “meh” pile, and there are so many books to still read that even if this is one of the only books with Middle-Eastern culture that I’ve seen, I’m not hugely tempted. Only slightly. Thumbs down seems to be the general verdict. Such a pity because the setting is fascinating and it is one I’ll read anyway just for the cultural experience. Sounds like better editing could have made a big difference. It’s actually funny because as much as I didn’t like Nasrin, I didn’t really like Sahar either. She was often mean towards Nasrin in a way that I wasn’t surprised that Nasrin didn’t really like her or express those feelings. I don’t know, their whole relationship was just weird. It’s really a shame because this book had so much potential! It really did! I read this book a WHILE ago, so I don’t remember Sahar being mean to Nasrin, but yeah, their relationship just seemed off. Like, they didn’t seem to actually love or like each other. Such a shame. This book had the potential to be one of THE books, the books that really help shape YA in a direction, and perhaps it still will, but from most reviews I’ve seen, overall response has been meh, not just us! When I was looking for other reviews to link to, I kept seeing many, MANY bloggers give it 2.5 stars.